INTRODUCTION. PART I. STUDIES USING EXISTING DATABASES OR NOVEL DATA COLLECTION. CHAPTER 1. Secrecy, Settlements and Medical Malpractice Litigation (Eric Helland aamp, Gia Lee). CHAPTER 2. Shedding Light on Outcomes in Class Actions (Nicholas M. Pace aamp, William Rubenstein). CHAPTER 3. Expectations, Outcomes and Fairness: Lessons from the Civil Justice Reform Act Evaluation (Stephen Carroll aamp, Joseph W. Doherty). PART II: CASE STUDIES. CHAPTER 4. Transparency in the Victim Compensation Fund (Jeremiah Goulka aamp, Robert Reville). CHAPTER 5. Understanding Mass Tort Defendant Incentives for Confidential Settlements: Lessons from Bayer's Cerivastatin Litigation Strategy (James Anderson). CHAPTER 6. Transparency and Expert Evidence in Mass Torts: Insight from Silica Litigation (Lloyd Dixon aamp, Stephen Carroll). PART III: REFORM PROPOSALS. CHAPTER 7. Transparency for Civil Settlements: NASDAQ for Lawsuits? (Stephen Yeazell). CHAPTER 8. 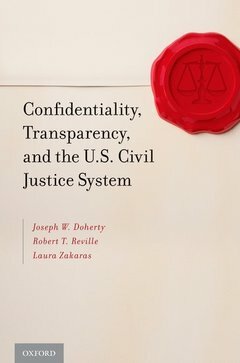 The Future of Court System Transparency (Lynn M. LoPucki). CHAPTER 9. Transparency Through Insurance: Mandates Dominate Discretion (Tom Baker). REFERENCES.